The Alwalkeria was a dinosaur which was discovered in India. It is believed to have existed about 235 to 215 million years ago. This phase lies in the Carnian and Norian ages of the Triassic period. As only a partial skeleton of the Alwalkeria was found during its discovery, it is difficult to judge its exact location in the taxonomic tree. It was first believed to be a theropod dinosaur. But on further inspection, it was seen that the features of its jaws more closely resembled the more primitive dinosaurs. Thus, presently, it is considered only a basal sauropodomorph or a basal saurischian. The Alwalkeria was a tiny dinosaur. It probably did not weigh more than 2 to 4 kilos. Its height is believed to be a little less than 1 feet and its length was about 3 feet from snout to tail. It could support itself on its hind legs. The larger, carnivorous dinosaurs likely predated on the Alwalkeria. It was a speedy runner, an adaptation developed to escape its predators. It was most probably omnivorous, thus its speed came in handy whilst hunting also. The name 'Alwalkeria' is derived from the name of the renowned British paleontologist Alick Donald Walker. Walker had worked extensively on the origins of early vertebrates and their familial relationships. The fossils which are today recognized as the Alwalkeria were originally named 'Walkeria'. This nomenclature was done by scientist Sankar Chatterjee. However, it was later noticed that the name 'Walkeria' was already ascribed to a polyzoan genus. Due to this, the dinosaur was renamed to Alwalkeria by Sankar Chatterjee and Ben Creisler. The binomial name Alwalkeria maleriensis was derived from the location of the discovery of fossils. The bones of the Alwalkeria were discovered in the Maleri Formation in Southern India. The classification of the Alwalkeria has been a matter of debate. Due to the incompleteness of the skeleton, scientists have found it challenging to positively identify its relationship with other dinosaurs. 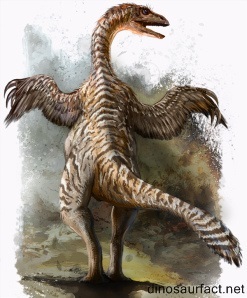 It was initially classified as a theropod dinosaur by Chatterjee when he discovered its remains in 1987. It was even thought to be related to the Herrerasaurids and hence classified under family Herrerasauridae. However, in the year 2004, Max Langer deduced that the Alwalkeria was under developed to be a theropod. He deemed that it should not be classified beyond order Saurischia. There are many similarities between the Alwalkeria and the Eoraptor. But the Alwalkeria existed a few million years after the Eoraptor. Furthermore, the classification of the Eoraptor is also disputed. Thus, it can only thing g that can be said safely about the classification of the Alwalkeria is that it was a primitive lizard hipped dinosaur. The remains of the Alwalkeria were found in the Maleri Formation in the state of Andhra Pradesh in India. They were recovered from the Lower Maleri section of the Maleri Formation. The holotype was discovered in the year 1974 by Sankar Chatterjee. He classified it more than ten years later in 1987. The bones of the Alwalkeria were found in the valley of the river Godavari. Many primitive dinosaurs were discovered from this region. The holotype of the Alwalkeria consisted of the maxilla and mandible, a few vertebrae, the bones of the shank and the astragals. The lack of a well preserved skull greatly affected the classification of the Alwalkeria. The jaws showed teeth which had varying morphologies, indicating that the dinosaur was a heterodyne. Its teeth were smooth which indicated that it was not a well evolved dinosaur. The femur of the Alwalkeria had an expanded proximal end. This, along with the relative short length of the femur, signifies that the Alwalkeria could sprint very fast. The fibula of the Alwalkeria was almost fused with the tarsals, indicating that this joint could not be moved much. The bones of the Alwalkeria are presently housed in the Indian Statistical Institute in Kolkata, West Bengal. The Maleri Formation is a part of the Pranhita-Godavari Basin in the southern part of India. The Pranhita-Godavari is divided into four sub sections, namely the Lower Maleri, the Upper Maleri, the Lower Dharmaram and the Lower Dharmaram Formations. The fossils of the Alwalkeria were recovered from the Lower Maleri Formation. The Lower Maleri Formation is the lowermost stratum of the Pranhita-Godavari basin and consists of fossils chiefly from the first half of the Triassic period. The other vertebrates discovered here include the Malerisaurusand the Hyperodapedon. The Alwalkeria was a petit dinosaur. It grew to the length of about 1 meter and stood only 0.3 meters tall. The mass of the Alwalkeria was very little; about 5 to 7 pounds. The head of the Alwalkeria was small and its snout was elongated. It had a long and tapering tail. The forelimbs of the Alwalkeria were much smaller than its hind legs. The Alwalkeria had a tibia which was much longer than its femur. This facilitated quick acceleration while running. It was a very lean dinosaur. It is difficult to determine what the Alwalkeria precisely ate for nourishment. But the heterodontic nature of the organism indicates that it teeth were adapted for both ripping and chewing. This has lead scientists to believe that it was omnivorous. The Alwalkeria was bipedal. It could achieve good amounts of speed in a very short span of time. It probably used this characteristic to catch its prey. The habitat of the Alwalkeria consisted of marshes, rivers and other water bodies. It is even possible that it hunted fish and other marine animals. It is interesting to note that the Eoraptor lived in a very analogous environment. 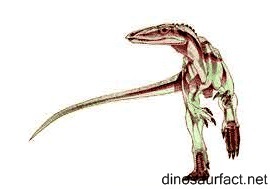 It is evident that the Alwalkeria was related to the Eoraptor. Although the two dinosaurs existed on different continents, it is possible for similar species to evolve separately. 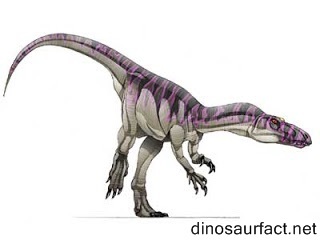 It is also believed that the Alwalkeria could have been related to the Herrerasaurus. 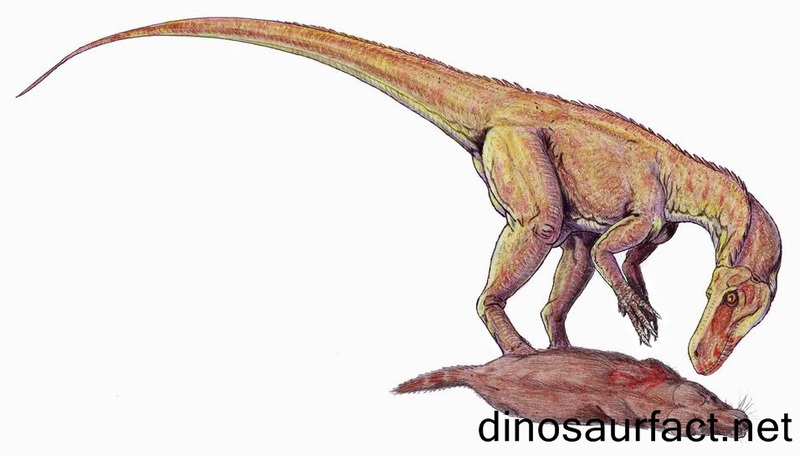 Although both the above mentioned dinosaurs are theropods, they could still have been related to the Alwalkeria as the theropod and sauropod distinction was not clearly defined in the Triassic period. Very little is known about the Alwalkeria, as is the case with most basal dinosaurs. Its precise location in the history of the evolution of dinosaurs in still a matter of contention, but its importance among Asian dinosaurs cannot be denied.